Global Equity Rally On The Brink? 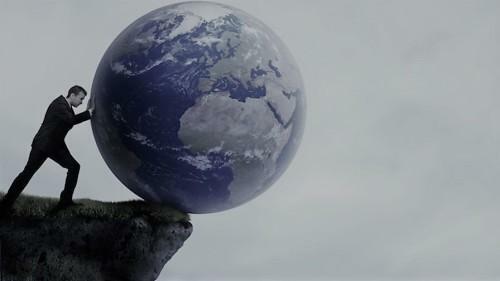 An index representing equity markets from countries around the globe is testing a potentially critical line of support. More than maybe any time in the past 2 years, we are seeing signs of dispersion in international equity markets. Some countries remain firmly in an uptrend, with some at or near all-time highs. At the same time, we are seeing equity markets in other countries that are getting slammed. This dynamic makes for interesting analysis in our daily charting trips around the globe. It is also makes for an interesting chart of the collective group of national stock markets, as represented by the MSCI All Country World Index, or ACWI. 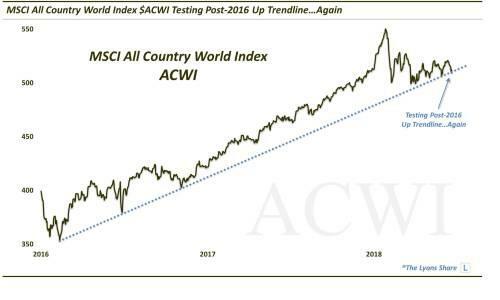 We say that as the ACWI is presently testing the Up trendline (near the ~510 level) from its 2016 low which connects the lows from Brexit and the U.S. Presidential election as well as those from March-May of this year. Will the trendline hold? Nobody knows, but we do not like the fact that the index has tested the trendline now 4 times in the past 3 months. The risk is that all of those touches have weakened the trendline and left it susceptible to breaking. Should it break, the risk is probably about 6-7% in the near-term. And even if the ACWI does hold this ~510 level, the upside potential may be modest until the index can clear much of the post-January resistance, a task to which it has shown very little inclination thus far. All in all, we’d have to say that risk is probably presently a bit more elevated than global equity bulls would prefer.